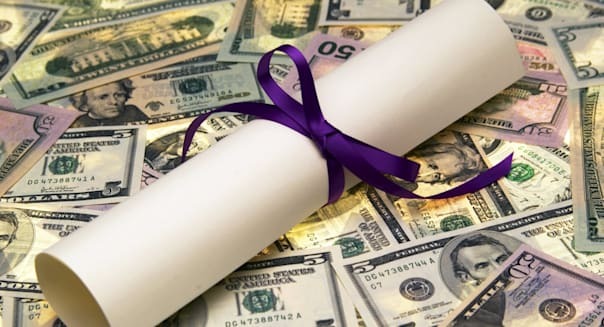 LOS ANGELES -- Americans typically spend nearly $5 billion on gifts for graduates, with a little over half giving cash and a third offering gift cards, according to last year's National Retail Federation survey. Those surveyed spent an average of $49, which won't buy a laptop, a retirement fund or many of the other gifts often touted as "financially savvy." Experiences give us more happiness than stuff, according to various researchers. You can put those findings to practical use in a variety of ways. "I'm a sucker for experiences over products, so I might give a gift certificate or Groupon (GRPN) to a nice restaurant or a Paint Nite with a few friends," said personal finance columnist Kathy Kristof, Los Angeles-based author of "Taming the Tuition Tiger" and mother of a recent college graduate. College consultant Shirley Bloomquist of Great Falls, Virginia, sometimes buys gift certificates for lunch, dinner or a theater outing for the graduate and a friend. Learning to fix meals from scratch at home will save your graduate a fortune. A good basic cookbook, such as Mark Bittman's "How to Cook Everything," is one option. Kitchen starter sets are another. Ikea has 7-piece cookware sets for $25 to $50, while Caphalon and Oxo have kitchen gadget sets for $40 to $50. College consultant Bloomquist recently gave a gift certificate for a cooking class to a law school graduate that she could share with some buddies. Transitioning to the work world often isn't easy. Grads may benefit from the services of a resume doctor, a career counselor, a wardrobe stylist, a fee-only financial planner -- or other professionals. %VIRTUAL-article-sponsoredlinks%"I know someone who had an interior designer just spend a day rearranging things in their apartment," said Zac Bisonnette, author of "Debt-Free U" and "Good Advice from Bad People." Such help, he said, "can turn an ad hoc sort of deal into something more adult." Professional help isn't cheap, however. The cost for any of these services can be $150 an hour, or more. Some may offer discounted initial sessions, but givers on a budget may have to resort to self-help books instead. For career advice, Lynn O'Shaughnessy, author of "The College Solution," recommends "Getting from College to Career: Your Essential Guide to Succeeding in the Real World," by Lindsey Pollak and "Graduate to a Great Job: Make Your College Degree Pay Off in Today's Market," by David DeLong. "Get a Financial Life: Personal Finance in Your Twenties and Thirties," by Beth Kobliner. "Style Bible: What to Wear to Work," by Lauren A. Rothman. "Apartment Therapy: The Eight-Step Home Cure," by Maxwell Ryan. If you're still leaning toward a cash gift, you might consider a reloadable prepaid card that allows users to track their spending and offers some protection against loss, theft or fraud. "The main advantage over cash is that cash tends to disappear quickly," said Curtis Arnold, founder of CardRatings.com and BestPrepaidDebitCards.com. "I have a son that graduated a year ago, and I would never give him a cash gift ... even though I required him to take a personal finance class during college." A prepaid card that charges fat fees is, however, the exact opposite of a financially savvy gift. Arnold recommends two lower-cost options: Serve from American Express (AXP) and Chase Liquid (JPM). Serve has a $1 monthly maintenance fee, free point-of-sale transactions and none of the typical hidden third-party costs such as ATM and cash load fees, he said. Users can also send money by email, text and Facebook (FB) and set up subaccounts to easily share money among family members, Arnold said. Chase Liquid offers unlimited free withdrawals at Chase ATMs. Point-of-sale transactions are free and there are no cash load fees. The card can be used for paying bills and its "sophisticated mobile apps" are well worth the $4.95 monthly maintenance fee, Arnold said. The card you choose could well become the gift that keeps on giving. "Once they spend your gift, they will hopefully consider reloading the card later rather than using a credit card and running the risk of increasing their debt load," Arnold said.